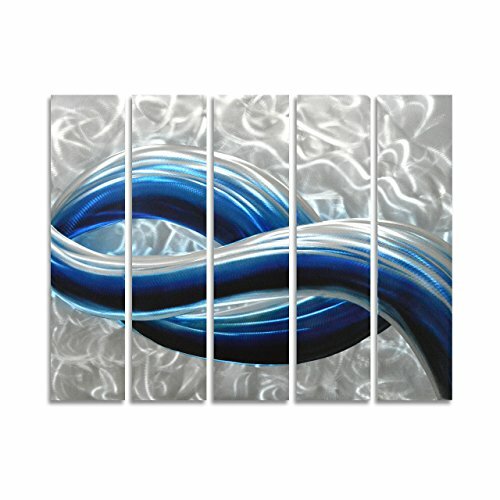 Pure Art Blue Skyline in Silver - Abstract Metal Wall Art - Modern Hanging Sculpture Set of 5 Small Panels - Decoration of 34" x 24"
Does your artwork make a statement? Artwork can utterly transform a room and take it from blah to something spectacular. More than anything, your home and living spaces are a statement about who you are and what you love. You've spent time and energy designing your home so that it's a reflection of you-your style, your personality, and your special brand of pizzazz. Why settle for generic flat artwork that just hangs there? Metal wall art is a unique type of artwork that adds dimension, depth and life to any room. And our metal wall hanging was designed to do just that. The large size, rich colors and abstract design create a unique and beautiful focal point to your space-whether in your living room, dining room, bedroom or office, this beautiful piece really creates an impact. Metal wall décor creates movement and motion in a way other art can't because of its interplay with light and you will see this artwork changing before your eyes as the light changes. This stunning colourful piece is handcrafted, original 3D art created on hand-grinded and sanded high-quality aluminum sheets, and made to last a lifetime. Our committed relationship with customers and our outstanding track record with decorating and design professionals is what makes our products and services a cut above. Pure Art offers a lifetime warranty. We love art and we love people and bringing them together is at the heart of all our products. Give your walls something to talk about. Click on the Add to Cart button to have your Metal Wall Art shipped today! If you have any questions about this product by Pure Art, contact us by completing and submitting the form below. If you are looking for a specif part number, please include it with your message.